"Baked eggs, smoked sausage, provolone cheese, spinach, and onions on an English muffin make a tasty, hearty breakfast--or even lunch!" Preheat oven to 350 degrees F. Coat a 2-quart rectangular baking dish with cooking spray. In a medium bowl, whisk together the eggs, milk, salt, and pepper. Pour into prepared dish. Bake for 20 to 25 minutes or until set. Meanwhile, cut smoked sausage into 6 pieces. Halve each piece lengthwise, cutting to but not through the other side to keep the pieces together. Heat a 12-inch skillet over medium heat. Add sausage pieces to skillet, opening each like a book. Cook for 4 to 6 minutes or until browned, turning once. Remove and keep warm. In the same skillet, heat butter until melted. Add onion. Cook and stir over medium heat for 6 to 8 minutes or until just browned and tender. To assemble, spread cut sides of muffins or biscuits with horseradish. Cut baked egg mixture into 6 squares. On muffin bottoms, layer cheese, spinach, egg, sausage, and onion. Add muffin or biscuit tops. 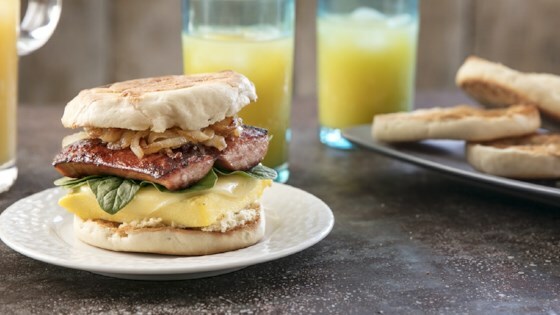 Pat those pancakes into a tasty breakfast sandwich! Instead of toasted English muffins, you can substitute baked large biscuits, split.